Young women are being given the chance to shadow an assembly member for the day in an effort to boost female participation in politics. The February event includes a Senedd tour, a question and answer session and a debate about the role of women. Helen Bradley from equalities charity Chwarae Teg said it wanted to show young women they could "play an important role in shaping the future". AMs from a range of parties - men as well as women - will be involved. The opportunity - part of Chwarae Teg's "LeadHerShip" project - for young women aged 16 to 25 is being staged on 27 February to mark International Women's Day, which follows in March. Ms Bradley said it would offer first-hand experience of what being a politician involved and an insight into the workings of the Senedd. 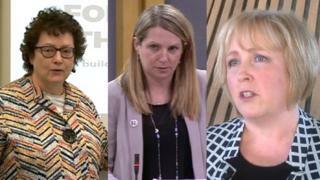 "Women are still notably absent from many decision-making roles in Wales making up just 28% of our MPs and councillors and 42% of our assembly members," she said. "People in these roles make decisions affecting every area of our lives and it's important to make sure that women's voices are listened to and that their needs are addressed. "We want young women's voices to be heard at the highest levels of Welsh politics to raise the issues that matter most to them."